From the Authors Preface: There is a unique and an individual quality in the Folksongs of the Kentucky Mountains, whether they be ballad, love song, or nursery rhyme, for they have sung their way through countless generations, unwritten and unrecorded, save by the few who still keep the love of a "song-ballad" in their hearts. It is the strong link which binds these people to the past, entirely detached as they have been from the outside world for so many generations. They have lived their lives oblivious of modern progress and have remained, like their forefathers, simple people of the soil. In presenting this volume, it is our hope, that we may share with others the genuine pleasure which these songs gave us when we first heard them in the mountain homes, where this valuable legacy has been unconsciously preserved. With but few exceptions, the origin of each song can be traced to its Eng­lish, Scottish or Irish source. Because of their preservation by oral tradition, they have been invested with a characteristic charm of their own, which we have made every effort to retain. No melody has been remodelled. The text has been changed only in a very few instances where memory failed to record words, lines, or stanzas necessary to complete a version. 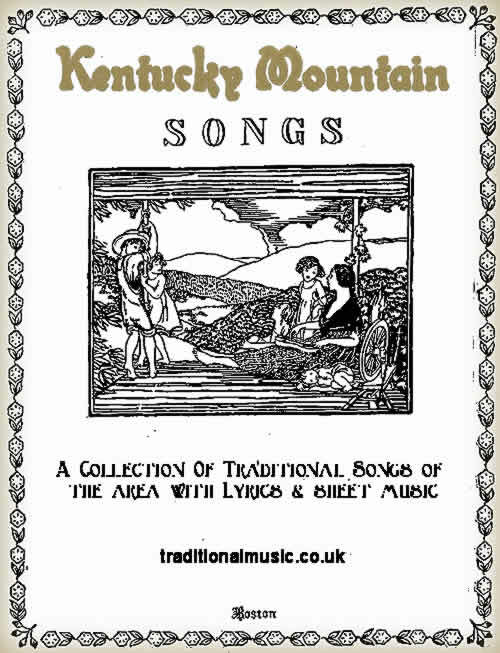 KENTUCKY MOUNTAIN SONGS, Contents list & Page Numbers. deduct 100 from numbers given to get the original book page number. .